Artificial Intelligence (AI) has the power to improve healthcare delivery across the continuum of care. AI can more quickly identify hemorrhages on CT scan in the emergency department; it can make surgeries safer in the operating room, reduce mortality in intensive care units; and it can help patients recover faster after being discharged. Artificial Intelligence could also assist emergency medical service (EMS) providers in treatment and triage decision-making in the pre-hospital environment. Take stroke for example. Patients suffering stroke need to be taken to designated stroke hospitals in order to receive adequate lifesaving treatment. Though stroke can be diagnosed with brain imaging at any hospital, it can only be treated at about 20% of them. Artificial intelligence can help EMS providers get stroke patients to the right hospital faster and reduce delays in treatment. Creators of artificial intelligence diagnostic tools, MaxQ AI (formally MedyMatch) has partnered with Samsung to deploy computer vision software on the approximately 15 ambulances in the country that have on-board CT scanners. 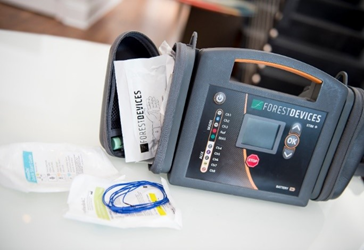 Forest Devices is developing a portable AI stroke identification device designed to be like an electrocardiogram (EKG) for the brain.